This book aims at tackling the question of body consciousness with regard to aesthetic considerations on the representation of the self in different fashion practices. The act of dressing ourselves is a routine for everyone. We choose clothes without thinking carefully, sometimes unconsciously, and at times this simple task becomes an embarrassing one. Once enveloped by clothing, our body cannot but avoid wearing the “meaning” of the chosen clothes. Fashion is something that goes beyond simple protection of our vulnerable flesh, but rather serves as a powerful medium that expresses ourselves by revealing our inner and outer condition through diverse criteria: the philosophical, aesthetic, political, or cultural, etc. Fashion potentially helps us overcome serious difficulties caused by corporeal appearances or social/cultural standards that make us suffer. 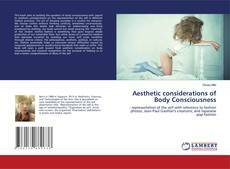 This book will open a path toward fresh aesthetic consideration on body consciousness and corporal recognition for the purpose of helping us to lead a better comprehension of ideas of the self.